Brock Lesnar is an American mixed martial artist as well as a former amatuer and professional wrestler who not only competed in college but also for professional wrestling organizations such as the WWE and WWF. He currently is an MMA fighter in the UFC where he is the current UFC Heavyweight Champion. Born in South Dakota in 1977, Brock Lesnar became a high school phenomenon with his massive build and relentless work ethic. Over the years, he has enjoyed an illustrious career in the spotlight of high-profile sports. Lesnar has spent time in the WWF, NFL, competing on the Japanese wrestling circuit and finally, the UFC. Today, he’s building a career in mixed martial arts, confident that hard work and his physical presence will give him the edge he needs to become a star. Brock was a successful college athlete where he dominated the collegiate wrestling field. He won the 2000 NCAA national wrestling championship and was an All American collegiate wrestler all four years of college. He then grew very popular as a professional wrestler in the World Wrestling Entertainment, as he became the youngest WWE champion in the history of the WWE, was a three time WWE champion, and a winner of the 2002 King of the Ring, and 2003 Royal Rumble. Lesnar also tried his luck in the NFL for the Minnesota Vikings after his WWE wrestling career, and in 2005 he joined the new Japan Pro Wrestling where he won the IWGP Heavyweight championship. Lesnar finally decided to try MMA and is now a member of the UFC and the new UFC Heavyweight Champion. Lesnar turned his sights to MMA. His size and strength stunned other MMA fighters at the Minnesota Martial Arts Acadamy where he trained under his coach Greg Nelson. Brock Lesnar announced on August 12, 2006 that he had signed a deal with the K-1 promotion. Brock’s first ever MMA fight was scheduled for the K-1: Dynamite! !USA fight night against Korean giant Choi Hong-Man on June 2, 2007. Prior to the fight however, Choi Hong-Man was scratched from the fight for unknown reasons and was replaced by Min Soo Kim. The last minute change in fighters didn’t seem to effect Lesnar, as he defeated Min Soo Kim by submission due to strikes just over a minute into the first round for his first ever MMA win. Brock Lesnar reached a deal with the UFC and on February 2, 2008 he made his debut with the UFC at UFC 81: Breaking Point. His first UFC bout was against Frank Mir, a former UFC Heavyweight Champion. While Lesnar nearly defeated him, a last minute kneebar by Mir ended the fight. It was a humble introduction to the UFC for Brock Lesnar. After UFC 82, the UFC announced that Brock’s next scheduled fight would be at UFC 87 against former UFC Heavyweight champion and UFC Hall of Fame inductee Mark Coleman. However, Coleman would end up withdrawing from the fight due to training injury he sustained and he was replaced by Heath Herring. At UFC 87, Lesnar came out against Herring strong, landing a right hand that knocked Herring to the mat and Brock continued to apply pressure and stay on the attack for the full three rounds. His efforts were rewarded as the judges scored the bout a unanimous decision in favor of Brock Lesnar. Lesnar’s next fight would be his first ever title shot when he was scheduled to fight in the main event Heavyweight title match against UFC legend Randy Couture at UFC 91: Couture Vs. Lesnar on November 15 2008. Lesnar stunned the world that night, as he beat the legend Randy Couture by TKO in the second round crowning him the UFC Heavyweight champion. The title fight was rescheduled for UFC 100 after Mir suffered a training injury and could not compete at UFC 98, when the fight was originally set for. The rematch was set for UFC 100. Lesnar absolutely dominated Mir from the very beginning of the first round, scoring takedown after takedown and not suffering any damage from Frank Mir. 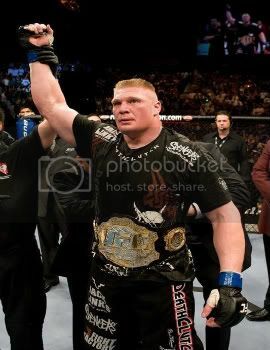 Lesnar won the match at the 2 minute mark of the second round when the referee stopped the fight and awarded Lesnar a TKO due to strikes victory over Mir as he defended his UFC Heavyweight title. Lesnar was very fired up after his win and flipped off the crowded stadium after the fans started to boo Lesnar for his post fight antics. In the post-match interview with Joe Rogan, Lesnar made some nasty comments about Bud Light, the events sponsor, because Bud Light apparently “won’t pay me nothing,” and proceeded to promote Coors Light instead. He then made some nasty comments to the crowd, and followed with a comment about getting on top of his wife after the fight. UFC President Dana White expressed his displeasure with the UFC Heavyweight champion’s actions after the fight and Lesnar publicly apologized at a post fight new conference for his ridiculous post fight antics and even sported a bottle of Bud Light at the interview. It has been rumored that Brock’s next fight will be against the winner of the Shane Carwin Vs. Cain Valasquez fight that takes place at UFC 104. A date and location for Lesnar’s next title defense is still unknown. 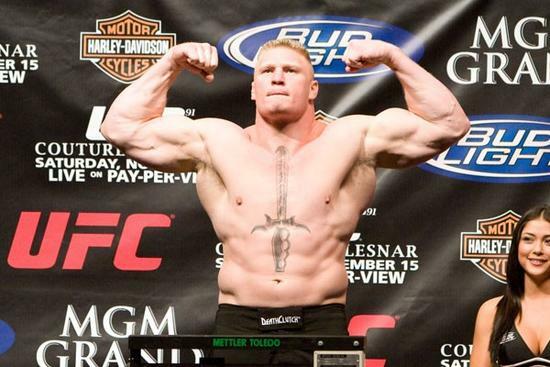 Convinced that MMA is where his future lies, Lesnar continues to develop and expand his fighting skills. Lesnar participated in football and wrestling throughout high school. His size and the dedication with which he approached his training helped catapult him to local stardom. At the end of his senior year, he had amassed a 33-0 wrestling record and received scholarship offers for both sports. Eschewing teamwork for individual performance, he chose wrestling and competed throughout college. In 2000, Lesnar became the NCAA Wrestling Champion. He has a number of collegiate awards to his credit, including 2 Big Ten Champion titles, 2 NCAA All-American titles and 2 NJCAA All-American titles. He won the NCAA national wrestling tournament in 2000 and was runner up in 1999. When he left college, his record stood at 106-5. Immediately after leaving college, Lesnar signed on with the WWF and made his TV debut in 2002. Fans were immediately drawn to his savagery and brashness. Later that year, he defeated The Rock to become the youngest WWE Champion in the organization’s history. Brock won many events with the WWF and WWE. In June of 2002, Brock won the WWE King of the Ring tournament when he defeated Rob Van Dam in the final round. In 2003, Lesnar won the Royal Rumble, one of the biggest events in the WWE, just two months later he won the WWE championship belt in the main event of WrestleMania XIX. However, by 2004, the stresses associated with performing in the WWF drove him to leave. By the end of the year, Lesnar had signed on with the NFL, playing with the Minnesota Vikings. Lesnar played for Minnesota in a few pre season games where he created controversy by starting minor fights during games and was criticized heavily by the Kansas City Chiefs for a sack Lesnar made on quarter back Damon Huard. But, due to injuries from a motorcycle accident, he was cut from the team. Lesnar’s next stop was the New Japan Pro Wrestling show. He spent several months dividing his attention between a lawsuit filed against him by the WWE (formerly, the WWF) and building a career on the Japanese wrestling circuit. Though he won the IWGP Heavyweight Championship, he was eventually beaten by Kurt Angle and left the New Japan Pro Wrestling show behind. Brock Lesnar is married to Rena Mero, better known as “Sable”. Lesnar was engaged to his ex-girlfriend Nicole but left her in 2003 to start a relationship with Sable, who he married in May of 2006. Lesnar has one daughter named Mya Lynn from his previous relationship with Nicole, a stepdaughter named Mariah, and a son named Turk, who he had with Sable and was born in June of 2009. The video games WWE Smackdown! Shut Your Mouth, WWE Wrestlemania XIX, WWE Crush Hour, Madden NFL 06, UFC 2009 Undisputed, and a few more. The cover of Flex magazine, in the Minneapolis’ City Pages, and on the cover of Muscle and Fitness Magazine for their February 2008 issue. A 2003 DVD made about his WWE career titled “Brock Lesnar: Here Comes The Pain” that highlights his career up through 2003.